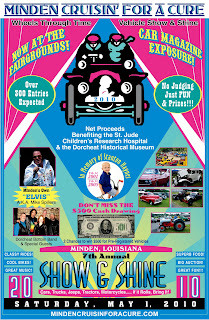 Saturday May 1st, 2010 will be the 7th year in Minden, Louisiana that antique and classic transportation enthusiasts have come together to show that they care. Held at the Minden, Louisiana Fair Grounds, you don't want to miss the 7th annual open class vehicle show and shine. If it has wheels you need to bring it out. This year’s show will include a silent auction, raffle items, $500 cash drawing, good fun, good people and a great time. Live music will be provided by Minden’s own Elvis, Mr. Mike Spillers and the Dorcheat Bottom Band with a few special guests to keep toes tapping for most of the day. Lots of goodie-bag items, plenty of Coca-Cola products and maybe even a few surprises before the day is over. Most of all lots of GREAT CARS, Tractors, and Motorcycles (over 300 vehicles have registered in the past with 4000 spectators attending this event)! This year the show has added available vendor and swap meet spots. In the past six years this show has given $73,000 for cancer research and $13,000 to the local museum. This show supports two great causes that are important to our area. 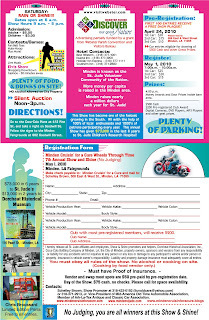 St. Jude Children’s Research Hospital and the Dorcheat Historical Association Museum, Inc. are two great causes that will benefit from the 2010 show. Show organizer and promoter Schelley Brown reports, last year over 90 cars had pre-registered by April 1st. Brown commented that most folks don’t pre-register for these shows they wait and see what the weather is going to do. This show has had weather issues in the past but surprisingly has always been able to pull off a very successful show. In fact this show is one of the fastest growing vehicle shows in the Southern region. This year the extra incentive again is for pre-registering is two chances in the hopper for the $500 cash drawing that will be given to a lucky show participant and $200 to the club with the most members pre-registered, Brown exclaimed, “This year, with many folks in need of extra money, I thought this would be a good way to get folks to travel the distance to come to Minden. Coming to a show is an expensive endeavor with gas, hotel and food cost on the rise. We are praying for beautiful weather and big crowds! I hope everyone in the area will come out and show their support and see the beautiful cars, trucks, tractors, bikes and just enjoy the day.